This blog entry about the events of Tuesday, June 26, 2007 was originally posted on July 15, 2007. PART 8: “I have decided that for the rest of the day, I will only say things I know in Croatian,” I said, having had no practice or knowledge of any vocabulary of the eastern European language. “I guess we’re not going to say a lot then,” Steph told me. Not surprisingly, my dumb little proposed verbal stunt didn’t last long when we started exploring our first and only day in Split, Croatia, where our ferry had docked before seven in the morning. I’d read in my guidebook that Croatia is a dichotomy of two cultures: the Eastern European-influenced inland area in the north, and the Mediterranean-cultured Dalmatian coast in the south, with its thousands of Dalmatian islands floating in the turquoise Adriatic sea. 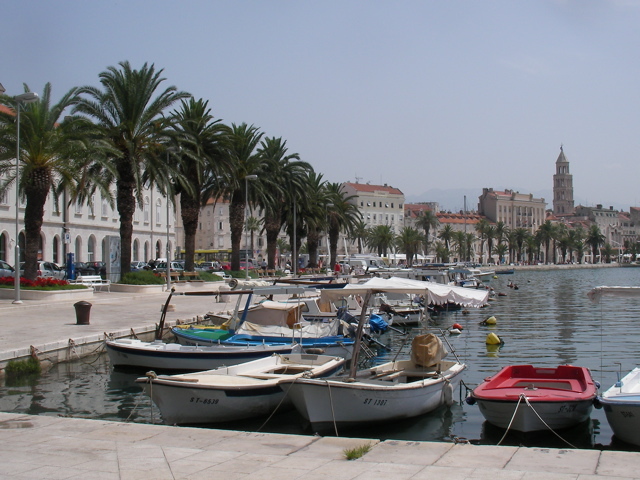 We had arrived in the latter, in Split, largest and most important city of the Dalmatian region, where we soon dropped our bags off in storage at the bus station just after docking. It was in Split that our introduction to a country neither of us had been to would take place, where our primer to the southern culture of the Dalmatia would begin: Dalmatians 101, if you will indulge my affinity for puns. “Maybe it’s too early and all the pretty people are still asleep,” I said — it was only about 9:30 a.m. Steph stood by her statement as the day wore on, pointing that our waitress had a hot body, but had a big ugly nose and man hands. The physical attributes of Croatians aside — I didn’t think they were all that ugly — Steph loved our surroundings, the city of Split. “This is adorable and definitely worth coming to,” she raved, contrary to Lonely Planet’s use of the word “ugly” in their introduction of it. Perhaps it was because Split’s newly developed waterfront district was brand new (picture above), just a couple of months old during our stay there, inaugurated after the guide’s publication date. Before then, the waterfront was a hodge podge of gritty bars with ugly neon beer logos. The new modern waterfront tastefully contrasts what is directly behind it, the Diocletian’s Palace, a UNESCO World Heritage Site, “one of the most imposing Roman ruins in existence” according to Lonely Planet. As Split’s showcase historical centerpiece, the old fortress is still in use today, not only as the city’s main tourist attraction, but as a functioning part of Dalmatian life — by that I mean the life of the local people, not the black and white spotted dogs that originated from, and were named after the region. Dalmatian people still live within the old houses, and even the fortification walls, that make up the palace complex; newer businesses like banks have built modern storefronts around the old Roman stonework to keep history preserved. The main meeting point for tourists — and lounging Dalmatians as well — was the peristyle, the central plaza. It is not a mistake that it is referred to as a “peristyle” — an architectural term used for open areas in Egyptian temples — for the former Roman square was designed with borrowed elements of the co-existing Egyptian empire: there is a statue of a sphinx and a cafe actually named after the Egyptian city of Luxor. Aside from the big rotunda on the south end of the peristyle where Steph and I had posed for photos (including one of me dizzy from spinning around in one place), the main edifice of the peristyle is the Cathedral of St. Dominius, a Catholic church converted from the Roman Diocletian’s mausoleum. “It’s such a mix of different styles,” Steph noticed. It wasn’t surprising that the church’s nave wasn’t typically rectangular or cross-shaped; this one was an octagon, formerly the main room of the mausoleum, with Christian symbols and cherub statues covering up any remants of its ancient historical past. In fact, according to the official guide pamphlet of the cathedral, “Emperor Diocletian was buried in a porphyry sarcophagus in this magnificent Mausoleum… [he] rested there in peace after he had tried to eradicate the Christian name. But history had the last laugh. The bones of the Christian martyrs, who he had brutally killed, now rest in the Emperor’s magnificent tomb and have been venerated for the last 1300 years.” Steph chuckled at the Christian slant to its history, how history is always written by the winners. The metamorphasis of the Roman mausoleum-turned-Catholic house of prayer was completed centuries later with the erection of the church tower, standing right next to the mausoleum building. From one historian to another, we joined in on the official daily walking tour of the rest of the fortress complex, led by a local Dalmatian woman named Tanya, a tall blonde that Steph and I both agreed was actually pretty. (Tanya admitted that she wasn’t typically Croatian-looking though, and was taller than most of her friends.) Tanya led us, along with an older English-speaking Italian couple and a couple from Arizona, around the historical town center for a walking lecture of Dalmatians 101. She took us from the peristyle, through the former basement halls (now a market of souvenir hawkers), and to each of the main gates of the palace. “I sure hope not,” he joked, mindful he was male. Other highlights of our walking tour were the Temple of Jupiter (another remnant of ancient Rome) and the “human traps,” where invaders were coralled into small courtyards, only to be locked in and attacked from above with scalding liquids and arrow attacks. It was interesting to see that many of the ancient structures were repurposed for modern life; the north tower was now an art gallery, and within the high archways were residences — we saw a woman hang her laundry atop one. Like many places in the world, it didn’t happen over night — Rome wasn’t built in a day, and neither were its off-site palaces — it was an evolutionary process since the old days. Away from these newer bars and discos of modern day Split, Steph and I decided to go the vintage, rustic route to Buffet Fife, a local restaurant that didn’t actually have a buffet, but was recommended by Tanya. “It’s a locals place,” she told us. Sitting at a table outside, we agreed with her; locals sat to share soups and fish stews, old men reminisced about yesteryear and most notably, a bar fight broke out at the adjacent building. All we heard was the sound of a struggle and breaking glass, and then a man came into our place with blood running down the side of his face. Despite the incident, we continued to people watch while eating our food: white wine, spaghetti, and platters of broiled fish, which attracted a hungry cat, who waited patiently for us to throw him a fishbone. “I caved,” Steph admitted, satisfying the lone feline amongst all the Dalmatians — the people I mean, not the dogs. That afternoon we did the best we could to cram in what we could of our crash course in Dalmatia, this time outside of the city center — the Dalmatian Coast (below the Dalmatian mountains) is known for its beaches and seaside culture, and we decided to at least partake in some of it for a while. “Okay,” I said, seeing Steph hold back her words, which came afterwards: “I’ll just sit back here because I’m just your lady. I should have told him I’ve ridden bigger bikes than this. My hog,” she said, once the proud owner of a Suzuki Boulevard S50. She didn’t make a scene and was just content to just be my lady on the back of our little scooter in the meantime. We rode around town, which looked like any old generic E.U. port town once we left the historical district. We rode off to Marjan Hill, Split’s urban oasis park in and around the big hill to the north of the city, and then zipped around to the other residenital areas where we bought cheap towels at a local store. The towels were for our quick dip in the sea at Bene Beach, a secluded pebble beach surrounded by pines — a place we went to when we could finally find it; it took us forever to find our way to the other side of Marjan Hill, driving in endless circles, seeing the same buildings and the same theater over and over. It wasn’t until we realized that the dotted line on our map was a tunnel that went through the hill that we got on track. Steph took to the handlebars while her man happily sat behind her to take photos of the scenic drive and the calm, lake-like sea below. “Did you pee?” I asked Steph while we were playing in the water. “Sure, why not? It’s the ocean, man!” Despite the anti-peeing signs I’d seen around town, I joined in on her antics for lack of a rest room near our spot on the beach. However, it wasn’t just a toilet that was lacking; so was a place for us to rinse off afterwards. I suggested going to Bacvice Beach, the overly crowded public beach not too far from the waterfront district, where I figured they’d have facilities. I was right — Steph said it was the best idea I’d had that day — but we didn’t shower without first considering going for another quick dip. The debate was short. “How many kids do you think peed in here?” I asked. I was turned off as well; while Split might have cleaned up since its days of the Romans and the pre-waterfront district days, I couldn’t imagine how much pee could have been floating in the sea with way more than a hundred and one Dalmatians swimming in it — and by that I mean the people again, not the dogs. In fact, we hadn’t seen any Dalmatian dogs that day, not even one. “I just realized you’re the only non-white person here,” Steph said on Bacvice Beach. “Uh, I noticed that immediately actually,” I said. “Because I am one.” Over the course of our day in Split, we only notice two others. MORE TO COME… Stay tuned! Sorry, these are slow-coming.